Can you really have a TV on your screened porch? What about fabric furniture? 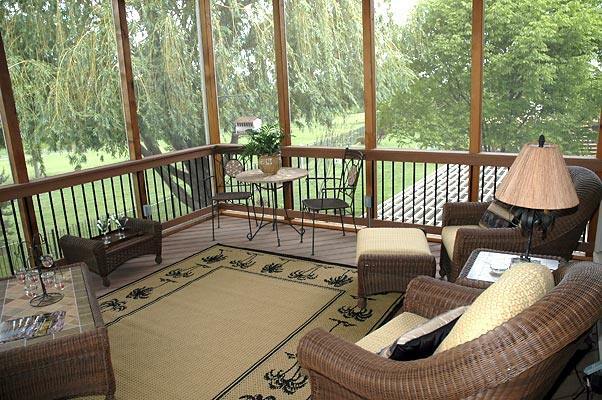 These and 3 other things you didn't know you could have on your screened porch. Can you have a TV on your porch? Does that TV have to cost a fortune? You absolutely can have a TV on your screened porch and it doesn’t need to cost a fortune. Find a wall within your porch where the TV will not be placed directly in front of a screen. This allows you to use an indoor TV which is more reasonably priced than one that is rated for outdoor use. Televisions rated for outdoor do exist but are quite cost prohibitive. For the price, you could purchase 2 or more indoor televisions. Our recommendation is to find the driest place in the porch to mount your TV. Mounting the TV on the house wall is often a great option. In most porches, people can find a place where they can shelter the TV – sometimes a section of screen is turned into a solid wall which keeps water from blowing in on that section. Some homeowners choose to enclose the TV in a cabinet or to mount the television over the outdoor fireplace. All are great options. 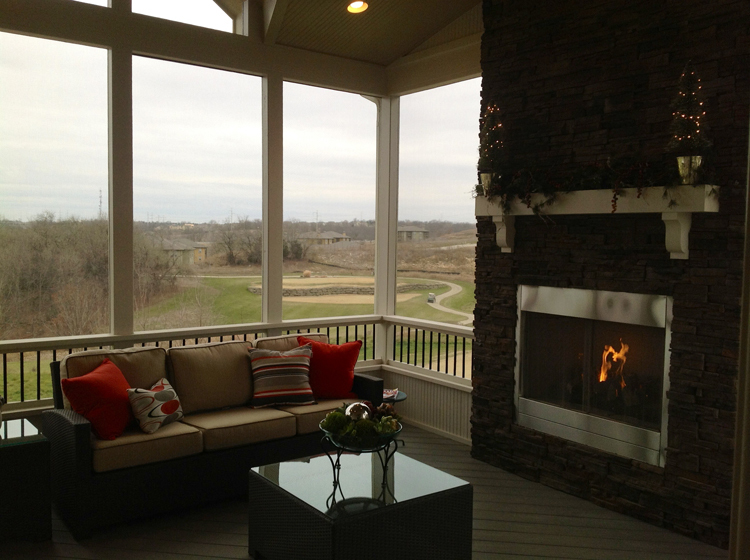 Can you have a fireplace on your screened porch? Does it need to be wood-burning? 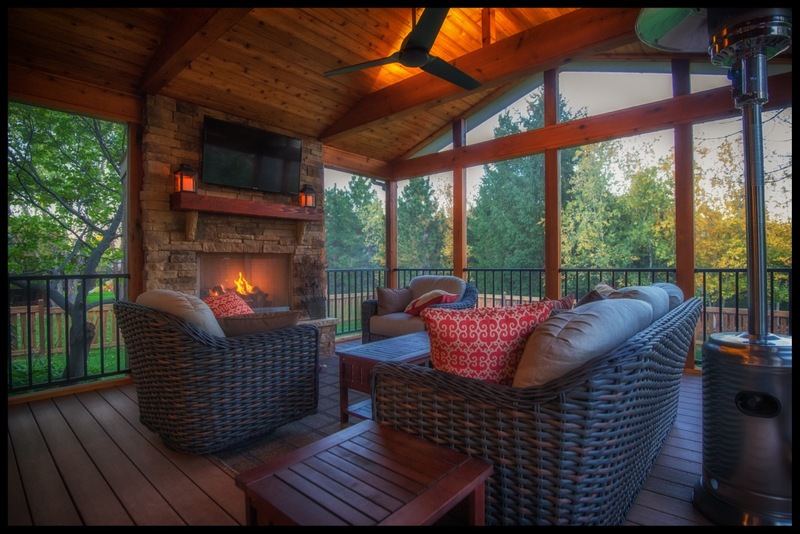 You absolutely can have a fireplace within your screened porch. There are building codes that affect the installation but we ensure your porch fireplace meets all codes. Your outdoor fireplace can compete with every aspect of your indoor fireplace. Choose the facade you prefer. Stone facades are quite popular. You can choose the hearth and mantle you prefer just like you can inside. We can build a gas-burning or wood-burning fireplace but the wood burning one can be cost prohibitive. A gas fireplace starts with an insert which is finished with a surround, chimney and running gas to the fireplace. Can you really have fabric furniture on your porch? You absolutely can have upgraded furniture. While outdoor furniture has come a long was in aesthetics since the days of stacking chairs, there are still some limitations with outdoor furniture that benefits being inside an enclosed roof and walls. Although you won’t want to use indoor fabric, take your pick of furnishings that utilize outdoor fabric such as Sunbrella solution-dyed acrylic fabric. Furniture used on your porch doesn’t need to be 100% waterproof and you won’t need to stand up the cushions to remove pooling water. Another benefit of fabric covered porch furniture is that it doesn’t suffer the extreme abuse of the sun’s rays the way it does when in direct sunlight. What about lighting? What else can the porch be wired for? There are table lamps and floor lamps that are designed to be outdoor/waterproof. They look almost identical to indoor table lamps and floor lamps. They are outdoor rated. You can use them for reading and for other uses when a ceiling fan doesn’t provide enough light. We can wire your porch for a sound system; however, today’s most advanced systems are completely wireless. These systems are not only higher quality but easier to connect in a porch. An experienced screened porch builder will also work with to determine how many outlets you should have on your screened porch. There are quite a few electronics you will want to use on your new porch. These include everything from furnishings such as floor lamps to electronics (like charging your laptop or iPad) and also to creature comforts that can include a cup warmer to keep your coffee warm while enjoying your porch in the colder months of the year. How about other decor items? Indoor/outdoor rugs are a great accessory/furnishing for your new porch. They’ve changed a lot over the last few years. Outdoor rugs are refined and improved with nicer patterns and many have a more indoor rug type feel. Indoor/outdoor rugs can be water resistant, mold resistant and resist other problems that face outdoor furnishings that suffer from prolonged direct sunlight and pooling water. If you’re considering adding an outdoor living space to your Kansas City area home, give us a call for a free consultation at (913) 851-3325, drop us an email or fill out the form below and we will get back to you right away.